MOUNT PROSPECT, ILLINOIS, (MAY 17, 2016) – The best recipes are those that combine both old and new traditions. In 1937, Assunta Cantisano started the RAGÚ brand by selling homemade pasta sauce from her front porch in Rochester, New York. Today, Mizkan America, Inc., is honoring that tradition of creating delicious sauces with the launch of NEW RAGÚ Homestyle, a mouthwatering line-up of thick and hearty pasta sauces. The new pasta sauce line boasts bold flavors and a thick and hearty texture that hugs pasta – a combination that pasta lovers will be able to see, smell and savor in every bite. “The RAGÚ brand prides itself on being ‘simmered in tradition’ in keeping with our brand’s rich heritage created by our Italian founder, Assunta Cantisano. We’ve never forgotten what she perfected – that a great sauce starts with great ingredients,” said Colleen Nash, Senior Brand Manager for Mizkan America, Inc. the makers of RAGÚ sauces. Made from a bold combination of vine-ripened tomatoes, onions, ground black pepper and fragrant herbs such as basil, oregano and fennel, RAGÚ Homestyle sauces are bursting with savory flavor. Using tried-and-true cooking methods inspired by Assunta, the ingredients are peeled, chopped and simmered to perfection. The result is a thick and hearty sauce that hugs pasta perfectly, making it an easy choice for classic family meals like spaghetti and meatballs. Every RAGÚ red sauce, including the new RAGÚ Homestyle Sauces, contains NO artificial colors, NO artificial flavors and NO high-fructose corn syrup. Even the most demanding home cook would be proud to serve NEW RAGÚ Homestyle sauces to their family, including celebrity mother of two and co-host of TV’s “The Real” Tamera Mowry-Housley. “I partnered with RAGÚ because, as a busy mom, made-from-scratch taste and great ingredients are must-haves at my family’s table. RAGÚ Homestyle sauces are not only convenient, they have a bold flavor that really enhances our favorite weeknight recipes,” said Mowry-Housley. “Pasta and sauce lovers everywhere will notice that new RAGÚ Homestyle has a heartier texture and the flavor is bolder,” added Nash. “We don’t take shortcuts to achieve this delicious made-from-scratch taste.” The brand’s promise is evident in a new recipe video from lifestyle influencer, Dzung Duong of the popular YouTube channel “Honeysuckle.” She prepares a delicious grilled chicken parmesan recipe paired with zucchini noodles, a fresh seasonal dish to enjoy outdoors with your family: https://youtu.be/S3QVZ6bxt8E. NEW RAGÚ Homestyle sauces are offered in five thick and hearty varieties – Traditional, Meat, Mushroom, Roasted Garlic and Four Cheese. In May 2016, all varieties of RAGÚ Homestyle can be found in the pasta sauce aisle at grocers nationwide for a suggested retail price of $2.49. 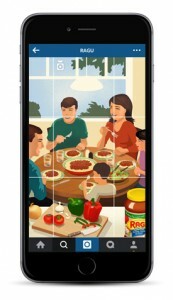 For even more recipe inspiration, visit www.RAGU.com and follow along on Instagram, Pinterest, Facebook and Twitter. 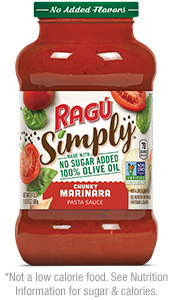 The RAGÚ® brand was founded in 1937 by Assunta and Giovani Cantisano and their sauce was originally sold from their front porch in Rochester, New York. Assunta carried her family’s recipe from Italy when she immigrated to New York in 1914, and it has now been enjoyed by American families for nearly 80 years. With a wide selection of sauce varieties ranging from the beloved Old-World Style to Meat Creations, Organic and now Homestyle, RAGÚ sauce is always “simmered in tradition.” Today, RAGÚ sauce is the go-to pasta sauce for families coming together to share a quick and delicious meal. For the very latest news, recipes and more from the RAGÚ brand, please check out the brand at www.RAGU.com. You can also follow along on Instagram, Pinterest, Facebook and Twitter. Based in Mount Prospect, IL, Mizkan America, Inc., is a subsidiary of the Mizkan Group, a global, family-owned company that has been Bringing Flavor To Life™ for more than 200 years. As one of the leading makers of condiments and sauces in the United States, Mizkan America maintains 17 manufacturing facilities that serve the retail, foodservice, specialty-Asian and food-ingredient trade channels. Since 2005, Mizkan America has seen dramatic growth and their portfolio now includes a wide variety of vinegars, Italian and Asian sauces, mustards, cooking wines, wine reductions, sushi seasoning, salad dressings and peppers. Mizkan America brands include: RAGÚ® , Bertolli®, Holland House®, NAKANO®, Four Monks®, Barengo®, Mitsukan®, Tres Hermanas®, Nature’s Intent® and World Harbors®. Mizkan America is also the exclusive distributor for Angostura® Bitters in North America. For more information about Mizkan America, please visit: www.Mizkan.com. The Mizkan Group is a privately held, international food manufacturer, headquartered in Handa City, Japan, with a heritage that spans more than 200 years. Always guided by the company’s Two Principles (Offer customers only the finest products; and Continuously challenge the status quo), the Mizkan Group offers a line-up of well-known international brands under the Mizkan umbrella and is a leader in the liquid condiment category. The Mizkan Group has operating facilities around the globe in places including: Japan, China, the United Kingdom, the United States, Singapore, Hong Kong and Taiwan. More information about the Mizkan Group can be found at: www.Mizkan.com.